The Shores Team was great in communicating with us before and after our stay as we encountered bad weather and they were flexible with our arrivel/departure times. The team wanted to make sure we were comfortable and safe. Everything was top notch during our stay. We were looking for a quiet winter get-away and this property was exactly that! It was close to town, just enough space for us and with all the amenities. Property was so close to beach, we could hear the waves at night. Would definitely recommend! 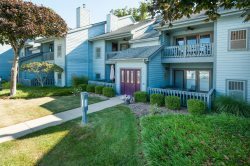 This home is in a perfect location to enjoy all South Haven has to offer. Easy walk to downtown shopping and restaurants and only 2 blocks from the beach. House was very clean and nicely decorated. We will definitely be back! We had a great time. Perfect getaway for the family. Right in the downtown so it was really convenient to get a cup of coffee or a little candy treat. The apartment had a nice common area where we could all hang out together...which is what we did most of the time. Only complaint I heard from the kids is that the hide-a-bed mattress was terribly uncomfortable. I sat on it and I have to agree. Just glad I didn't have to sleep on it. The Shores Team are very friendly and ready to answer any questions. They are very knowledgeable about the area and are willing to work within schedule/budget limits. Ease of booking and check-in/out were also great. Great updated property, great location, very clean and nicely appointed decor, exceeded our expectations. Would not hesitate to stay there again. They called me on Saturday just to see if I needed anything. Very friendly. All the decorative touches made it so homey and comfortable. This is a well decorated, comfortable, clean unit with a tremendous location. Check in was a breeze and communication was very effective. We would stay there again. Such a lovely place to stay. The location was great, not right in the middle of town but close enough to the roads & highways to get there quickly. We loved all the modern updates but the character of the house was still nice too. The backyard & fire pit area were wonderful. We would have appreciated a little wood to have gotten us started but did go out & get some. The only suggestion would be to have some brochures about local places & a suggestion list for places to eat. We really enjoyed our girls getaway & would definitely recommend this home to others. Our power went out in our house and the staff could not have been nicer or more accommodating! They found us a new house to stay in and even sent us our laundry (that was stuck in the washer) to our home. We were THRILLED with their service. It was very nice. Our little puppy had a good time as well. We would definitely stay here again. Was good. Would do it again. Every year, it has been a pleasure working with Daun. She is always very helpful and friendly and responds to emails quickly! As I mentioned, we have a group of seven girlfriends that all graduated together, back in the mid-70's. We have stayed in touch ever since and love getting together in South Haven. We were able to relax and enjoy family-time. Something that cannot be achieved at a hotel!